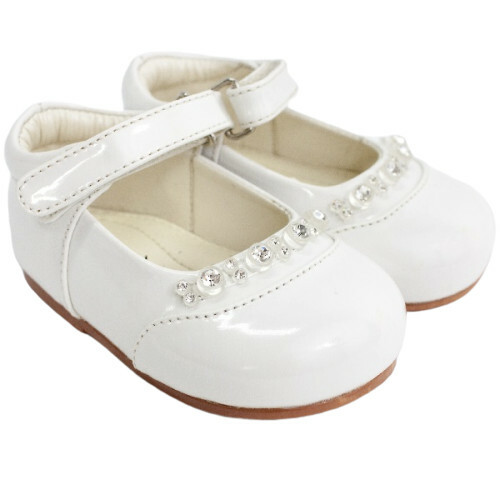 Girls white patent diamante shoes, perfect for your little girls christening day, attending a wedding or simply a special occasion. 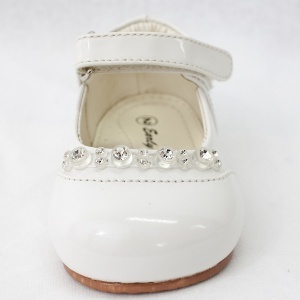 These lovely formal shoes are of a white plain shiny patent. They have a secure strap with velcro fastening to the side with a stunning sparkly diamante trim across the front of each shoe. Hard sole for walking children. These shoes will beautifully compliment her christening dress, flower girl dress, party dress etc. Complete with all inside shoe packaging to keep the shoe in shape and supplied in an 'Early Steps' black shoe box. Materials: Leather upper (with patent coating), cushioned textile lining, outer sole (other materials). We ordered these shoes for my young niece to wear as flower girl at our wedding. The shoes arrived very quickly and were as lovely as they looked on the website. They fit my niece's feet well and she enjoyed wearing them for the whole day. A great purchase. Recommended. These shoes were purchased as part of a christening outfit. They are a perfect fit and and they matched the rest of the outfit beautifully so I am very satisfied with this product. I would just like to add that the service from you was excellent and I would have no problem ordering goods from you again and would certainly recommend you to other people. Perfect for a wedding ! I bought these for my daughter to wear at my wedding as my flower girl. They fit perfectly and looked beautiful.